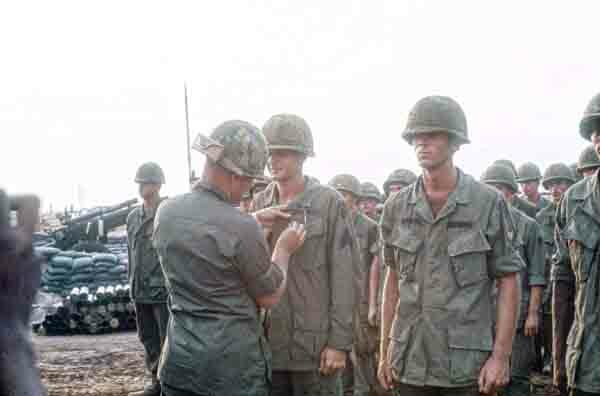 Captain Richard Neal pins a medal on Sergeant Pierce while Dan Bounds waits for his. Those not in the front line are living props. Standing formation in full uniform was miserable so I took pictures to avoid being a living prop. Both men will soon get the best award; going home alive and intact. Being “short” was the ultimate status and everyone knew their count of days remaining until they could depart. (DEROS) Short timers would say things such as “I am so short I can walk under a dime” and carried a symbol denoting their status. Joshing about “time left” in Vietnam crossed the officer/enlisted barrier. A short timer private had more status than a general with 4 months left and might tell him. Initiating conversation with a general was improper military behavior but accepted over days remaining in Vietnam.